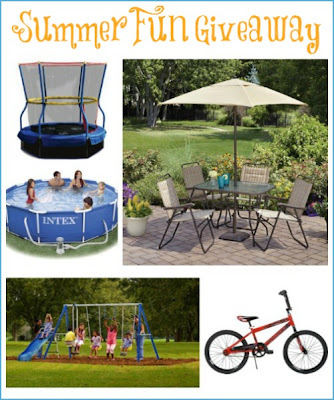 This is one amazing prize pack just in time for summer! Everyone is covered from mom, dad to the children. This is one way to not have to hear, "Mom, I'm bored!" Good luck and make sure you complete as many entries as you like as the more you enter, the better your chances in winning. Disclosure: I received no compensation for this publication. My opinions are my own and may differ from those of your own. YOUR BLOG NAME HERE is not responsible for sponsor prize shipment. Please contact teri@mompoweredmedia.com with questions or to see your business or blog featured on the next big event! I like gardening in the summer. Relaxing at the beach is my favorite summer activity. A Day at the Beach is my favorite activity! I love just being outside exploring. My toddler is very curious so I let him lead what we do. My children and I love swimming in the summer! The pool and swing set is amazing!! My favorite summertime activity is sitting on the front porch watching the chickens. We like to go to the pool. anything outdoors with the kids! Sleeping in a hammock in the yard.